We had a great turnout for Earth Day on Saturday! Thank you for all the volunteers that came to help! 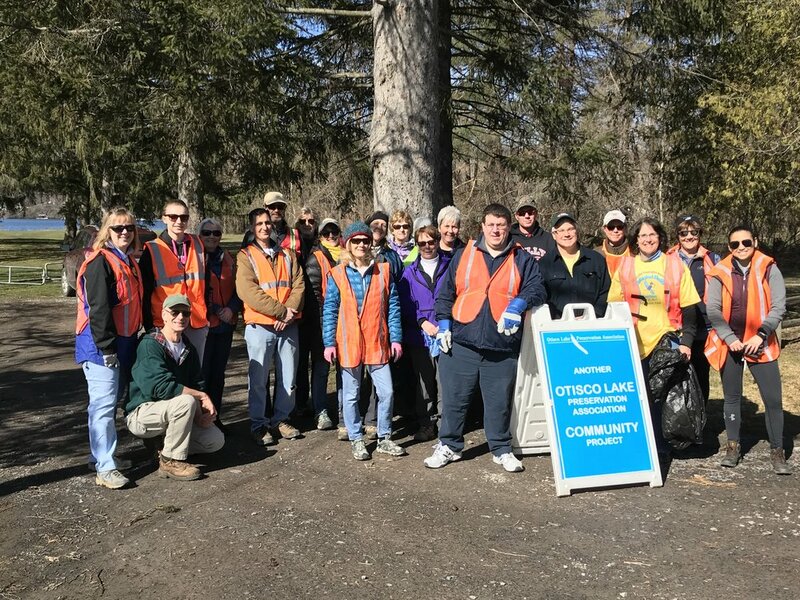 Sponsored by the OPLA and the Central NY Section of the American Chemical Society in association with Cornell Cooperative Extension, Otisco Lake Community Association, Amberations, and Onondaga County Resource Recovery Agency. Since the 1970s, Earth Day has been an annual reminder of our collective obligation to protect the planet that provides for our wellbeing. There is no better time than Earth Day to revisit that message. In his 2010 TED presentation, Let the Environment Guide Our Development, Johan Rockström, Director of the Stockholm Resilience Center clearly laid out the range of current environmental challenges for our global community, including climate change. How can anyone look at the consistency of the trends that Rockstöm identifies, and ask whether humansare causing these changes? With specific regard to climate change, the better question would be how could it not be related? The work of Rockström and his colleagues has provided the basis for a better understanding of the environmental stresses that humans place on the planet. Undoubtedly, to resolve these issues there will need to be stronger links between business practices (including research and design) and the branches of science that support a systems perspective including biochemistry, environmental chemistry, green chemistry, and toxicology. Attention to climate change is an urgent need and there are two pieces to the issue - awareness and action. Information to support awareness and action are discussed in separate sections below. The United Nations Intergovernmental Panel on ClimateChange UNIPCC) has been leading the charge for several years. As reportedin the March 30, 2014 New York Times, the latest publication of the UNIPCC, entitled Climate Change 2014: Impacts, Adaptation, and Vulnerabiy, discusses the nature of risks and states that the ill-prepared for climate change. On February 27, 2014, the U.S. National Academy of Sciences along with the Royal Society (the UK equivalent of the National Academy of Sciences) released a new publicati Climate Change: Evidence and Causes that is intended to help broad audiences understand climate change. The national aeronautics and space administration has issued a NASA consensus statement that provides a list of agencies and organizations that have issued climate statements. National Oceanic and Atmospheric Administration (NOAA) provides additional tools for outreach on the NOAA climate webpage . Meanwhile, the USEPA has issued warnings of ecological affects to help the public understand the extent of potential changes that could occur. While the scientific case for climate change is well established, the mainstream media still casts doubt. In his book Storms of My Grandchildren (2009), former head of the NASA Goodard Institute for Space Studies, Dr. James Hansen expressed his natural tendency as a scientist to prefer to present the data and let others decide how to respond to the data. Politics was not something that he was interested in. As time went on, however, he struggled with the thought that his grandchildren might ask him later - if he understood the potential dangers of climate change, why did he not do something about it? I share those same conflicting feelings and understand that others do as well. However, like Dr. Hansen, the thought of not doing anything for the younger generation, including my daughter’s future, overrides the natural preference to not get involved. I am also reminded of cultural anthropologist Margaret Meade’s comment: Never believe that a few caring people can’t change the world. For, indeed, that’s all who ever have. So, I am compelled to act and invite others to join the effort. Locally, for Earth Day the Syracuse Chapter of the Citizen Climate Lobby and GreeningUSA are leading advocacy for climate change action. GreeningUSA is placing a full page ad in the Syracuse Post-Standard and renting billboard(s) space with a climate change message. As of March 31, they were approximately $700 away from their goal of $4,400 for these efforts. If you would like to personally contribute to GreeningUSA for this cause, a tax free donation can be made by clicking on GreeningUSA. The deadline is April 9. Make Earth Day count. Tell your representative that you are a member of the Otisco Lake Preservation Association, and that you support legislation to curb greenhouse gas emissions and prevent climate change. Also, thank them for their efforts toward this goal.